Globe and Mail Advisory Panel on Post-Secondary Education: Humanists Need Not Apply? Well, they are all part of a group of “Advisors” that the Globe and Mail— the national newspaper that has decided that it’s its “Time to Lead” — has consulted about the state of post-secondary education in Canada. Quotes from each, of about a hundred words in length, feature as part of a weekend Interactive special, “Transforming the Ivory Tower,” in which readers can watch videos from several other “Voices on Education,” as well as contribute to a poll that asks whether or not readers think Canadian universities continue to be “relevant.” Presumably the Globe means relevant to contemporary society. It hasn’t bothered to specify. From the way many of these Advisors talk the assumption might be, relevant to a capitalist economy. There is so much talk amongst them (and the “Voices” featured in the videos) of networks and systems and “cognitive skills” and outputs, you’d think students were machines, and universities factories. The insistent note: universities must do better at addressing the “economy” and the “market” in order that their graduates can secure jobs. Well, the twenty-five people above have something else in common: not one of them is a humanist. That’s right: the Globe has brought together 25 people it would like its readers to regard as authorities on the subject of post-secondary education in Canada, and it hasn’t bothered to include a single humanist amongst them. It wants to talk about the state of the contemporary university in Canada, but its panel of Advisors does not include even a single voice from the Humanities. Is it any wonder, then, that not a single one of these Advisors refers to universities as places for the generation of thought, or places where students study the history of ideas in order that they might innovate in relation to what it exists in order to bring a better world into being? Surely universities are places where we give students something more than, as the French philosopher Jacques Rancière puts it, “the intelligence of their job,” or “unintelligence befitting their subordinate position” (my emphasis). This is not to say that we do not need (in the current state of the world) a great deal of skilled labour. Of course we do. But why would we limit what the contemporary university can achieve by defining its role in relation to providing students with specific skills to secure jobs in a world that desperately needs to redefine what we do if we are truly to develop the individual and collective talents of humanity? Sure, if the Globe and Mail wants to purvey to its readers advice on how to reshape universities so that they supply skilled workers for the digital economy — or so that they become glorified technical schools — it should speak to people invested in matters of technology and business. But if it truly wants to consider how Canadians might redefine the contemporary university, why doesn’t it try talking to a few humanists? This entry was posted in post-secondary education in canada and tagged canadian centre for policy alternatives, christopher murphy dalhousie, david helfand quest, david trick david trick and associates, dominic giroux laurentian, george siemens athabasca, globe and mail, globe and mail transforming the ivory tower, harvey weingarten, heather munroe-blum mcgill, humanities in canada, ian clark university of toronto, iglika ivanova, jacques ranciere, karen foster saint mary's, mayo moran university of toronto, melonie fullick york university, paul davidson aucc, pierre-gelier forest, robert campbell mount allison university, robert huish dalhousie, robert luke george brown college, ron burnett emily carr university, ross finnie university of ottawa, shauna sylvester sfu, sheldon levy ryerson university, sidneyeve matrix queen's university, steve joordens university of toronto, ted hewitt sshrc, tom través dalhousie. Bookmark the permalink. 5 Responses to Globe and Mail Advisory Panel on Post-Secondary Education: Humanists Need Not Apply? Thanks for this Carolyn. Important revelation but unfortunately not surprising that our “newspaper of record” might forget their interests exclude the humanities. 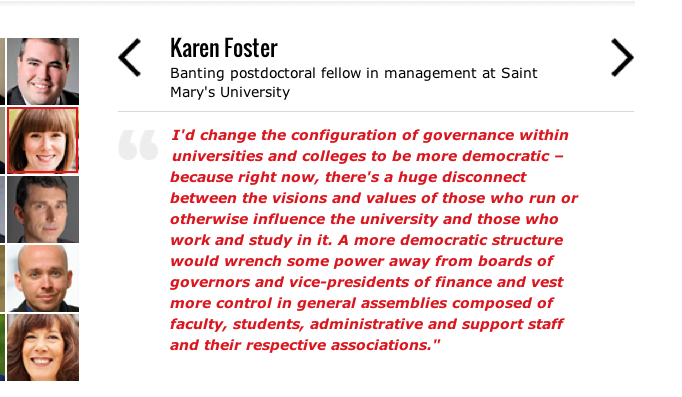 Karen Foster here — thanks for the mention, and I have to say I completely agree with you. I’m not “in” the humanities but I do consider myself to be “of” them. I felt like a kook trying to steer the online chat toward the question of the university’s benefit to society (NOT the economy). I’m not sure if it’s still up online, but that question spurred a bit of thinking on the “intrinsic” benefits of a university education… which was not exactly what I meant. It seems wherever they can’t commodify the products of their work, the humanities are forced to articulate their worth in terms of individual growth and development — like ‘we should be around so that your daughter can go to university and study literature if that’s her liberal individualist dream’ — and that’s a real shame. Iglika Ivanova here — thanks for raising these important issues. 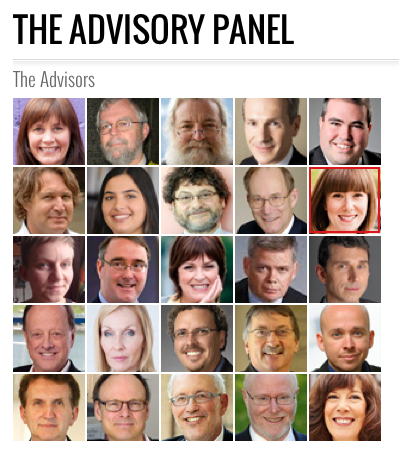 I agree with you that the advisory panel could have been more representative of diverse views. It could also have been more representative of Canada’s population: it is heavily male-dominated (I counted only 7 women of 25 advisers, making it close to 2/3 men), and almost entirely white. I was just going to make the point that Iglika made, above, about the 7/25 and the almost all white panel (24/25). The Globe is not getting it.